Standing, or more correctly sitting, at the threshold of a three day weekend, I am reminded of all the promise that weekends like this hold. I am sure the next three days will fill quickly with activity. I already have commitments for important events like watching the Ravens football game on Sunday and as many of the other playoff games as I can possibly squeeze in. Mostly small projects will be accomplished and the ever present shopping requirements for unimportant things like food. And then there is also a basketball game and a birthday party to enjoy for diversion. It is hard to believe that Lucas is two years old already--where has the time gone? I am amazed at how quickly the terrific trio of boys are growing. 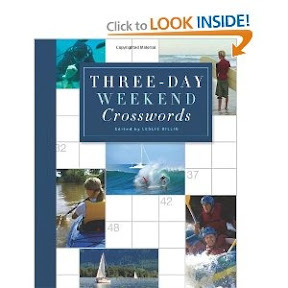 I know for sure that I will not be spending the weekend in a chair doing crossword puzzles though. It will be busy and fun.